We offer a range of training that supports volunteering, resilience building and individual progression. All training is delivered by qualified and experienced trainers who have an interest or specialism in the topic they are delivering. 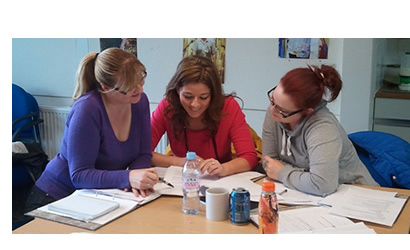 All Innovates training is delivered in an informal and relaxed environment; we encourage and deliver for varying learning styles and aim to make the learner feel as comfortable as possible. We have four ranges of friendly professionally delivered training please click on the links to find out more information about the courses. Various dates available please contact us for dates, or to book a place. This can be undertaken as a stand alone workshop which gives a general introduction to volunteering and can be complimented by any of the other workshops in this range. This can be undertaken as a stand alone workshop which gives a good basis of information for anyone wishing to show their skills and attributes that have been gained and developed through their volunteering and can be complimented by any of the other workshops in this range. This can be undertaken as a stand alone workshop which gives a general introduction to health and safety whilst volunteering and can be complimented by any of the other workshops in this range. This can be undertaken as a stand alone workshop which gives a general overview of varying communications skills and when and how to use them whilst carrying out a volunteering role and can be complimented by any of the other workshops in this range. This can be undertaken as a stand alone workshop which gives a general idea and tools to become more adept at time management and can be complimented by any of the other workshops in this range. This can be undertaken as a stand alone workshop but can be complimented by any of the other workshops in this range. This can be undertaken as a stand alone workshop and closely links with retention and motivation. It can be complimented by any of the other workshops in this range. This can be undertaken as a stand alone workshop which is closely linked to managing volunteers. It can be complimented by any of the other workshops in this range. Depending on your role, this may be the only level of training you need, although most people will benefit from attending the full range we offer. For practitioners whose work engages them with families where domestic abuse is or has taken place. Delegates must have some experience of working in the field of domestic abuse or must have attended the Innovate Volunteering one day domestic abuse awareness course. This workshop compliments the workshops in this range ad when completed as a full range gives delegates an understanding of the varying areas. For staff / volunteers who may lack confidence using the Freedom Programme Home-Study Course with their service users, but who already work in the field of domestic abuse and have an awareness or for those who have already completed Innovate Volunteering domestic abuse awareness course. This introductory session will illustrate how to support a women through the Freedom home study course. They will then be able to support friends and clients through the home study course without attending the full Freedom Programme training course. This workshop compliments the workshops in this range. Organisations or groups who want to have training delivered to their staff or volunteers which is entirely relevant and planned to fit bespoke requirements. All are trainers are experienced in the subjects they are delivering on and can adapt the training to suit the need of the organisation. Before doing this course I'd have never had the confidence to stand up in front of people and speak, now look at me!